Oh dear... First day back at work for a week. Yuk. As much as I love the people I work with, I would much rather be at home, crafting up a storm! Is it wrong that I've told them that too?! Anyway, a quick and simple card from me today but one which fits a few challenges.... Stamp Something (I was inspired by that big ole cake in the photo! ), Crazy 4 Challenges (Cupcakes!) and Crafty Catz (Buttons and Bows). 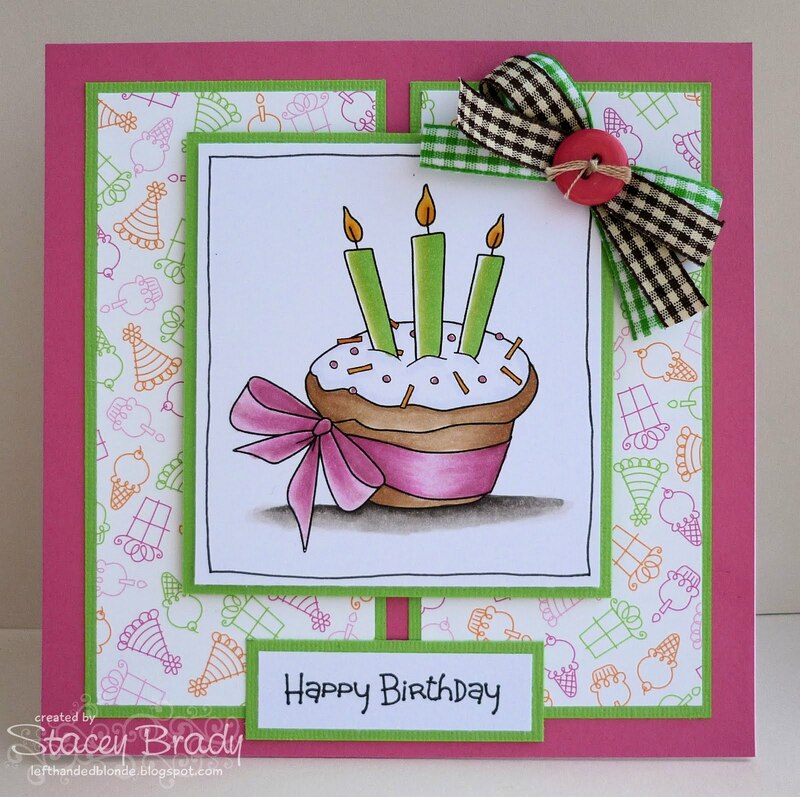 Stamps: An oldie by DigiStamp Boutique. Copic Markers: E29, E31, E33, E35, E37, R81, R83, R85, YG03, YG63, YG67, W1, W3, W5, W7 - available HERE from DTDF. Embellishments: Button and ribbons from stash. A wonderfull card Stacey! And good luck today!! Super cute and fun card STacey, great colours and the image is sweet! Great card and wish you the best with the work! It would be nice to make a job from your hobby isn't it? Yup, I think alotta us would love to craft all day and get paid for it...ahhh...wouldn't that be the life? Your cupcake card is oh-so-sweet!!! Stacey thsi is fabulous, oooooo love that cupcake image and your fantastic layout! Yum-o card Stacey!! Love this cupcake image!!! Morning Stacey...gorgeous card...good enough to eat! Thanks for sharing with us at Stamp Something Photo Inspiration Challenge this week!